The Duck Hunters were Dr. Paul R. Meyer Jr. and the author. The plan was to fire up the Cessna 310 (N4120Q) on Friday November 7, 2003 and fly from the Gary-Chicago Airport to the Southland Airport in Sulphur Louisiana so as to be ready for the Saturday morning start of the Louisiana duck season. 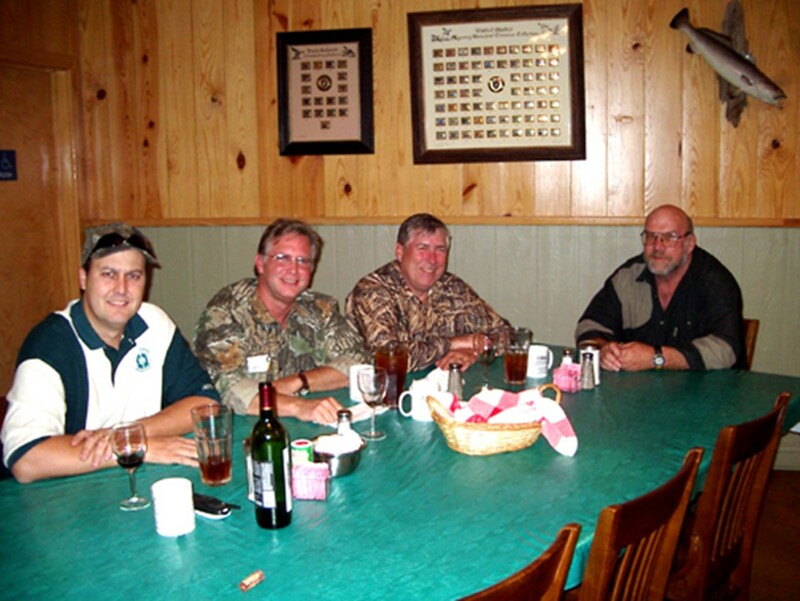 We would be joining senior officers and board members of Brookshire Bros. and staying at the Hackberry Rod and Gun Club. In Louisiana, like most states in the United States of America, there are two 30-day duck-hunting seasons during which hunters can be licensed to shoot specific types of ducks. 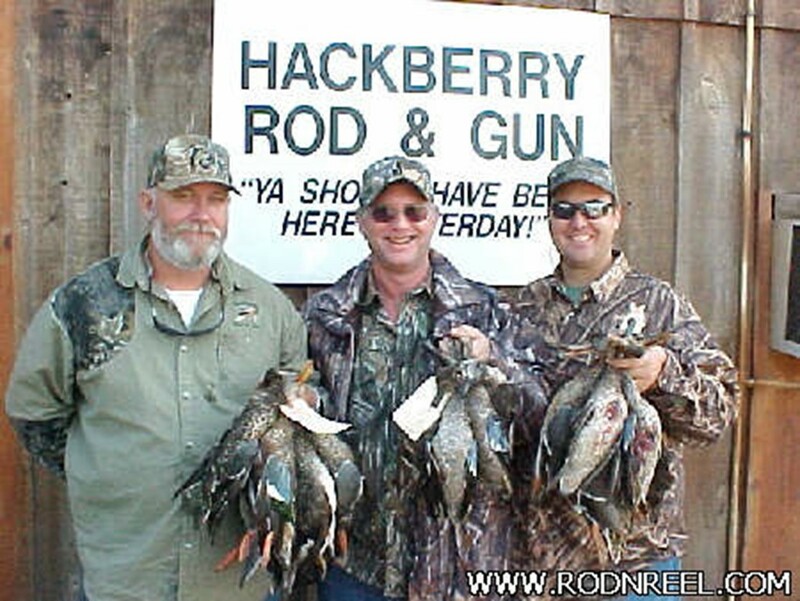 The license is good for only 6 ducks per day, which defines each hunter’s “limit”. 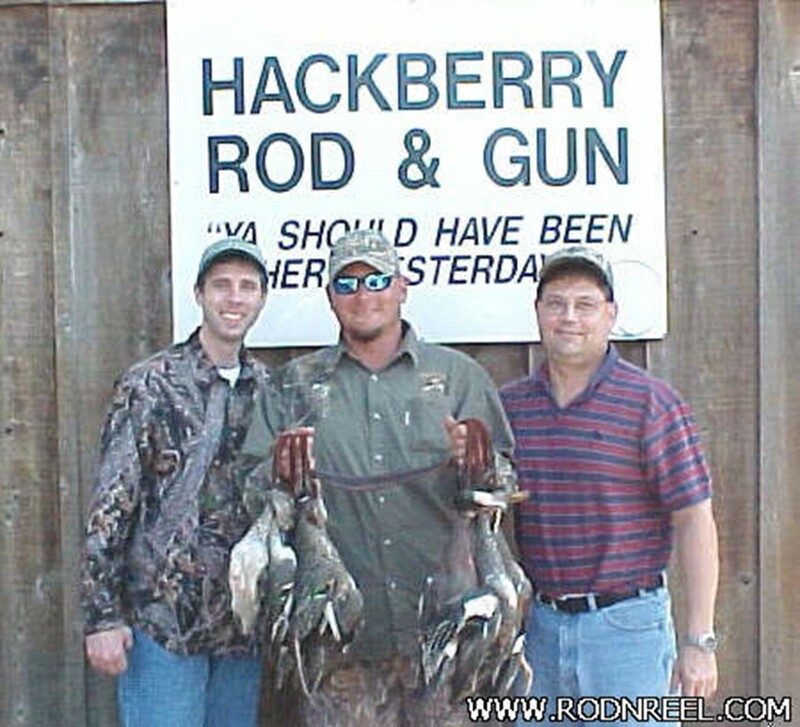 The first duck season of 2003 started on Saturday November 8. In Chicago, we loaded up the car at 6:30 AM Friday morning and headed toward the Gary-Chicago Airport, stopping only for bottles of water and some snacks at the local White Hen Pantry. Dr. Meyer performed the preflight checks while the author loaded the luggage. Fuel was added to the wing locker tank for the long, 5-hour flight to Louisiana. Dr. Meyer flew as pilot-in-command (PIC) for the flight south. In general, the flight was uneventful. The weather was beautiful for the first two hours but deteriorated a bit through Kentucky and Tennessee. We watched as a little bit of frost developed on the propeller spinners. Had the icing moved to the wings, we would have had to seek a lower altitude. We were lucky, however, and the clouds cleared and the temperature warmed. Fig Newtons, coffee and water kept us nourished for the flight. We arrived at the Southland airport just about as scheduled. We had to descend through a low cloud layer but broke out at about 3,000 feet and proceeded to the airport. A very friendly ground crew met us and we gladly accepted their offer to hanger the airplane during the weekend for a very modest fee. Jerry Johnson, the Chief Administration Officer of Brookshire Bros in Lufkin Texas, had driven to Louisiana for the hunt and picked us up at the airport. We were at the camp by 3:00 PM. 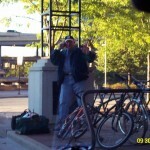 Terry Shaunessy greeted us. 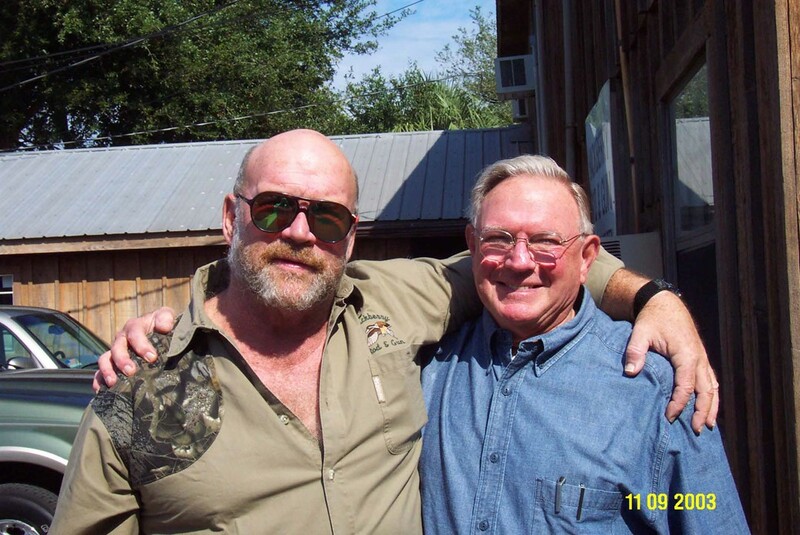 He founded the Hackberry Rod and Gun Club and is now only passively involved. His three stepsons very effectively run the club. While I tended to a conference call, Jerry and Dr. Meyer climbed onto a fishing boat and hit the lake. Following my phone call, I partnered with Donny Johnson, Chief Financial Officer of Brookshire Bros., and headed off to do some fishing as well. It was dark by the time the boats came back to the camp. Shortly after docking, the other two members of our group joined us. John Kober flew in from Dallas and was picked up at the Lake Charles airport by Van Seneca, the local resident, attorney and Brookshire Bros. Board member. 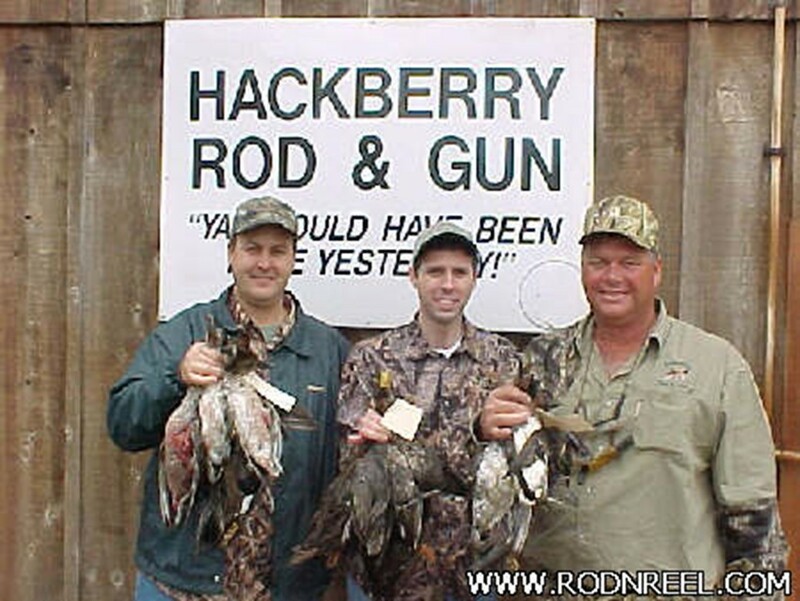 It is probably a mistake to call the Hackberry Rod and Gun Club a “camp”. 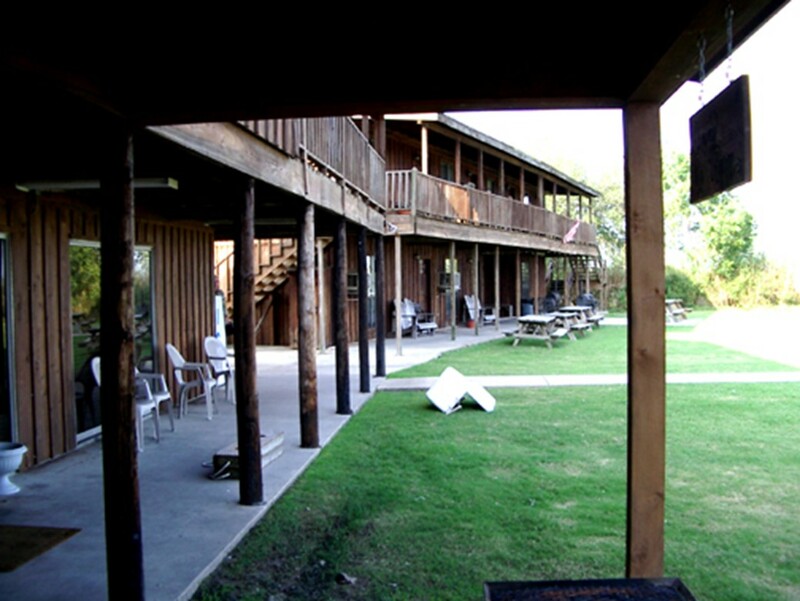 This is a facility set right on the inland waterway in Hackberry Louisiana. There are seven large dormitory rooms that sleep six persons each. Each room has a single bathroom with a shower. There are kitchen facilities in each room, but with the outstanding menu provided in the dining room, there is little need for anyone to think about using the kitchen facilities. In addition, there is a dining hall and a store that sells HR&G clothing, ammunition and other necessities. 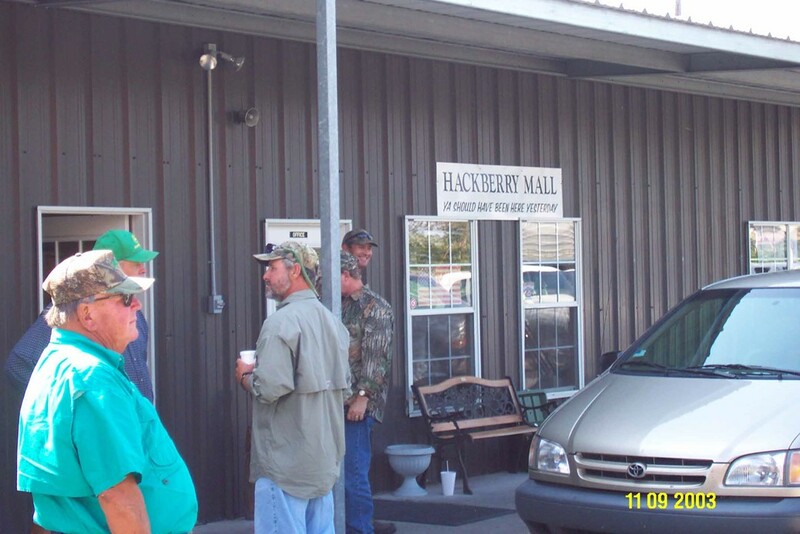 This is affectionately known as the Hackberry Mall. 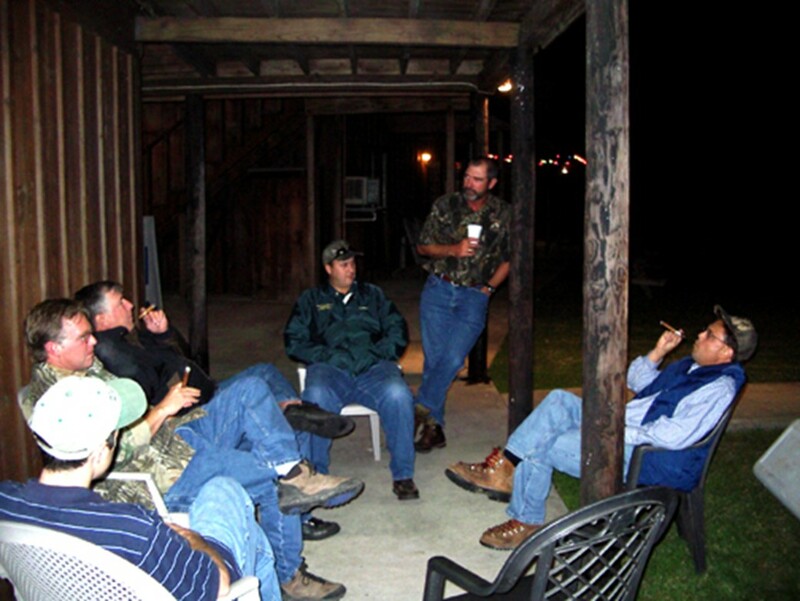 During the hour before dinner, we enjoyed camaraderie, cigars and some good Macallan Scotch. Dinner was served in the dining hall that was newly constructed since duck hunting a year ago. Below, Dr. Meyer and Donny Johnson do a little bonding. 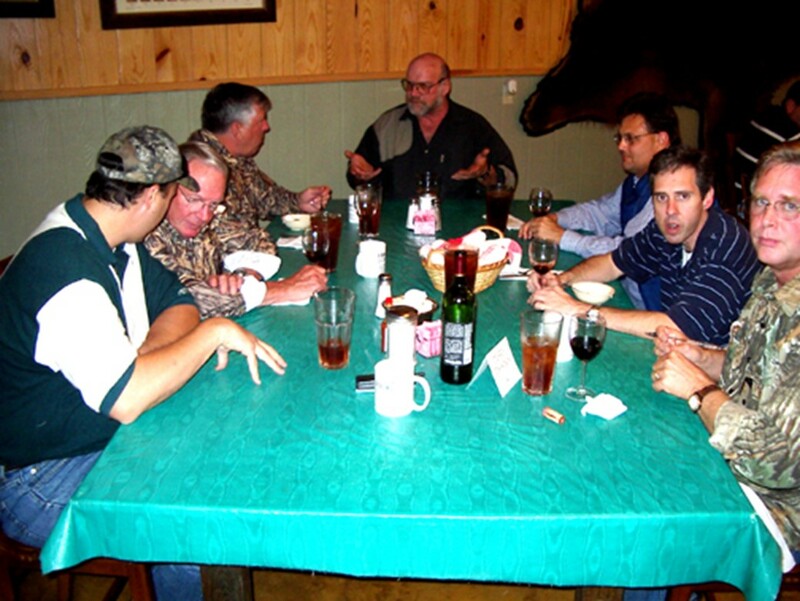 …and Terry Shaunessy holds court and the head of the table. In the picture below are Donny, Jerry, the author and Terry Shaunessy. Everyone was in bed and asleep before 10:00 PM as we all knew the wakeup call would come at 4:00 AM. As promised, Saturday morning at 4:00 AM, someone came in flipping on all the lights and making sure everyone was awake. There was immediate competition among the six of us for the one bathroom. Slowly, everyone stumbled over to the dining hall for coffee and breakfast. Now, somewhere, there were people out duck hunting who have to skip breakfast. Somewhere, there are those who get by on a piece of toast. 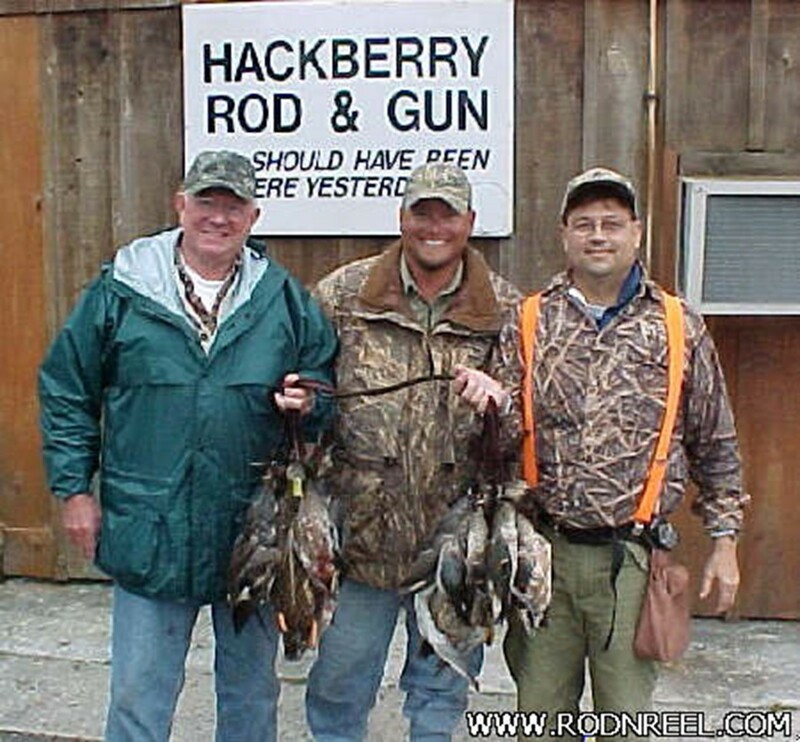 But, let me tell you that at the Hackberry Rod and Gun Club, there is no “getting by”. We enjoyed a full breakfast with eggs, bacon, toast, “monkey bread”, creamed chip beef on toast (SOS for the Army types), orange juice and coffee. It was all hot and all delicious. At breakfast, we were divided into groups of two and assigned to a guide. The guide had a pickup truck with a dog and somewhere out there he had a duck blind that he had setup with decoys. 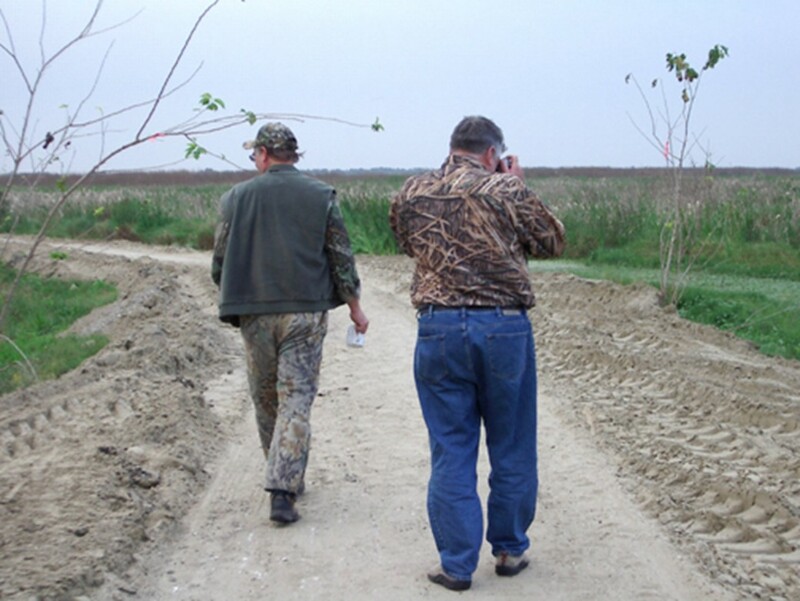 The first day, Dr. Meyer was partnered with John Kober and their guide was Grant. 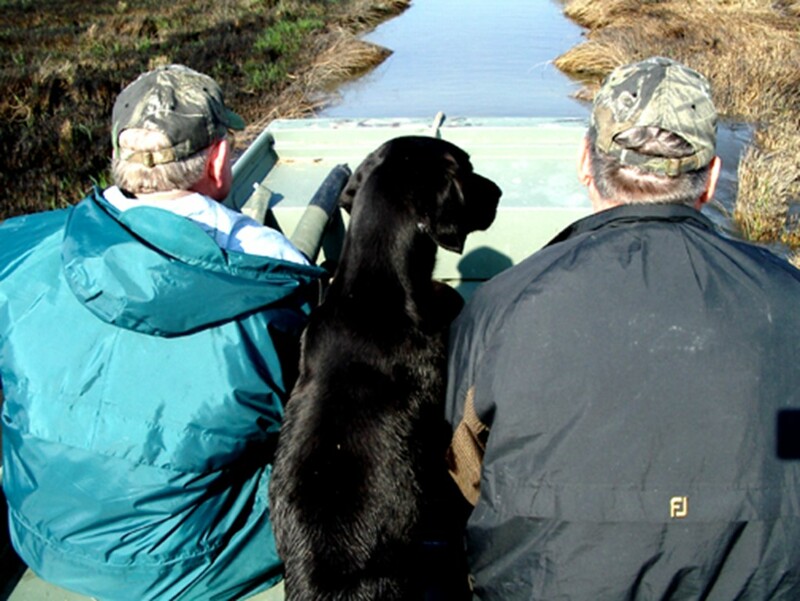 The author was partnered with Jerry Johnson and their guide was Bart with his dog Daisy. The ride to the duck blind was about 1 hour. We left the camp at about 5:00 AM and were in the blind at about 5:45 AM. A quick check with a flashlight confirmed that the blind was clean with no “visitors” (critters). 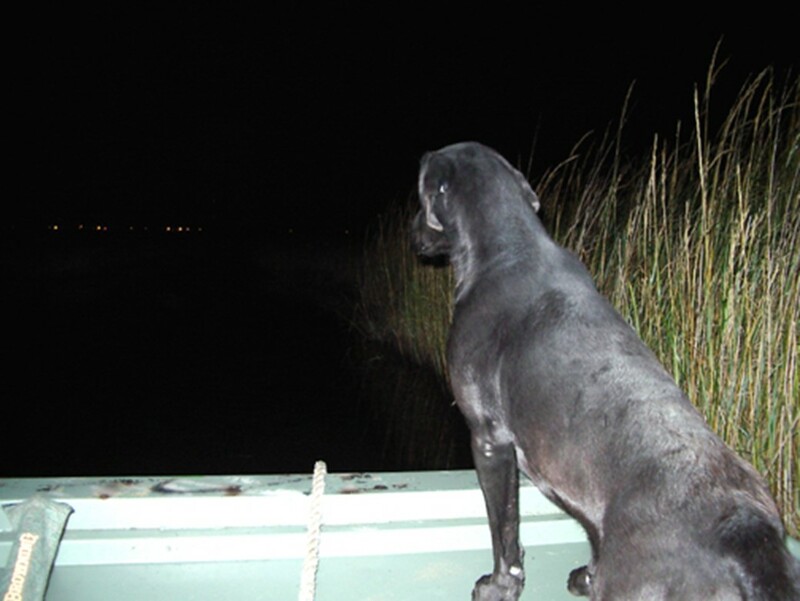 We piled in with our guns and ammunition and waited for the sun to rise and the ducks to approach. On this first day, we were quite lucky. We saw numerous ducks and had shot our limit by about 8:30 AM. In the middle of the 2-½ hour stay, there was about a ½ hour lull during which no ducks flew in. We used the time for a cigar break. 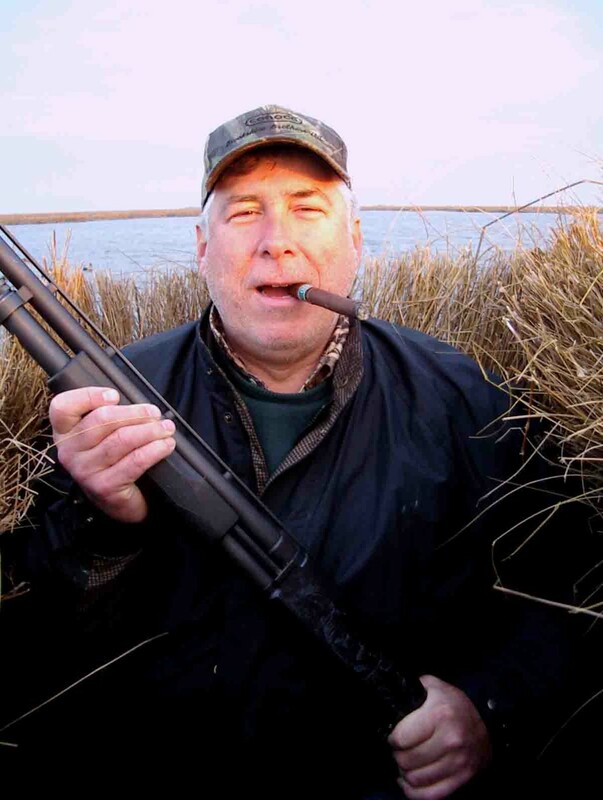 It should be noted that the author is not a life-long duck hunter. In fact it was rather remarkable that on at least two occasions during this time in the duck blind, the author experienced the sensation of aiming at a duck, pulling the trigger, and watching the duck fall. Now, it could be a coincidence and actually Jerry and/or Bart were aiming for the same duck. But, I don’t think so. I’ll take the credit. After we shot our limit, we climbed back into the boat, motored back to the pickup truck, tagged our ducks and drove back to the camp. Jerry and I were not the last to get back to the camp, but close to it. All of the groups had shot their limit of ducks this first day. The dining hall kitchen had fresh gumbo waiting for everyone upon their return. The gumbo was served with a side of delicious potato salad. The groups traded war stories about the hunt and then returned to the sleeping room where Donny Johnson had already searched the channels and found the Oklahoma versus Texas A&M football game. This started off to be a good game, but when Oklahoma had scored 70 points in the first half, Donny came under a lot of pressure to seek other channels with other games. 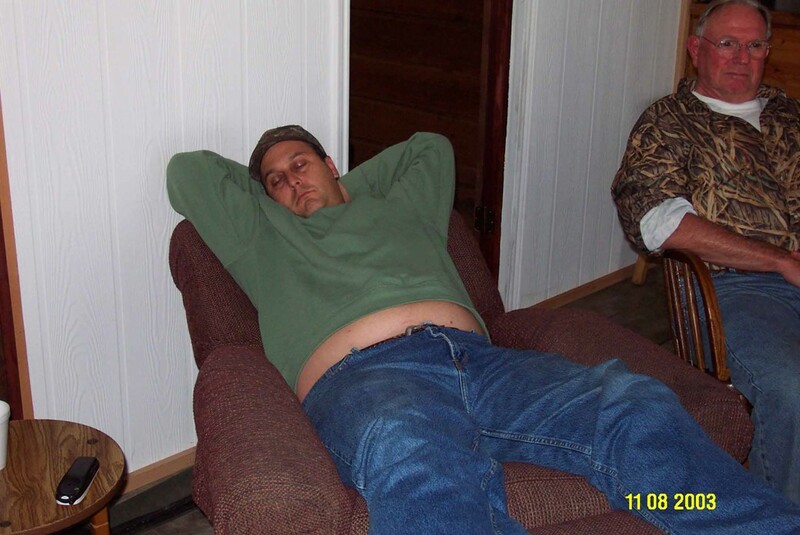 For a long time, Donny retained control of the remote and managed what game was watched and for how long. Before too long, however, we all benefited from divine intervention. Donny got a call on his cell phone from the new minister at his church and left the room to take the call. At that point, he forever lost control of the remote. The Lord giveth and the Lord taketh away. 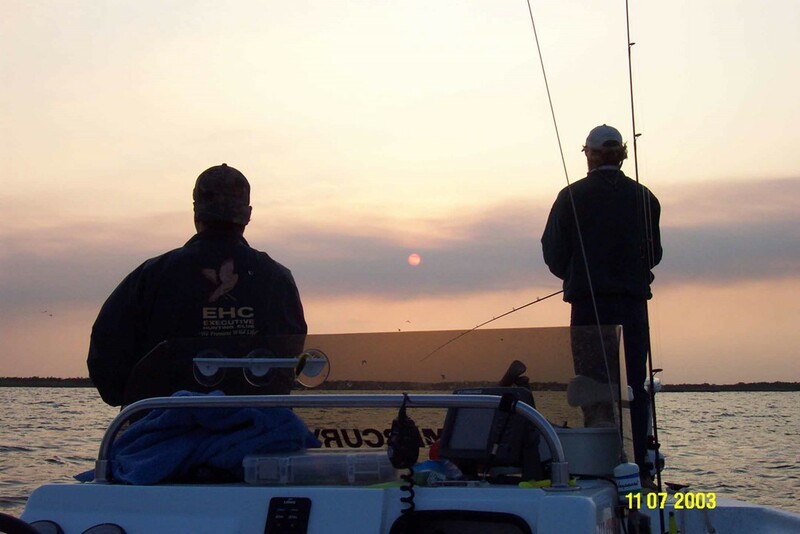 The afternoon weather started off cold and windy and there was consensus that it was a poor afternoon for fishing. The fishing guides were all sent home and the six of us settled in for an afternoon of college football. Having awoken at 4:00 AM, the energy level was on the low side and with the overwhelming victory by Oklahoma, Donny felt free to relax. That is not the remote on the table to his right, that is his cell phone which was the medium for the divine intervention. Dr. Meyer to his left had captured and maintained control of the remote. I think we all took turns with naps to catch-up on the lost sleep. A coffee cup with a little scotch put Jerry Johnson over the edge. Toward the end of the afternoon, Jerry offered to take Dr. Meyer and me out to see some alligators. He knew just the place. The three of us climbed into Jerry’s pickup and headed south. After about ½ hour, he pulled into a parking space on the side of the road. 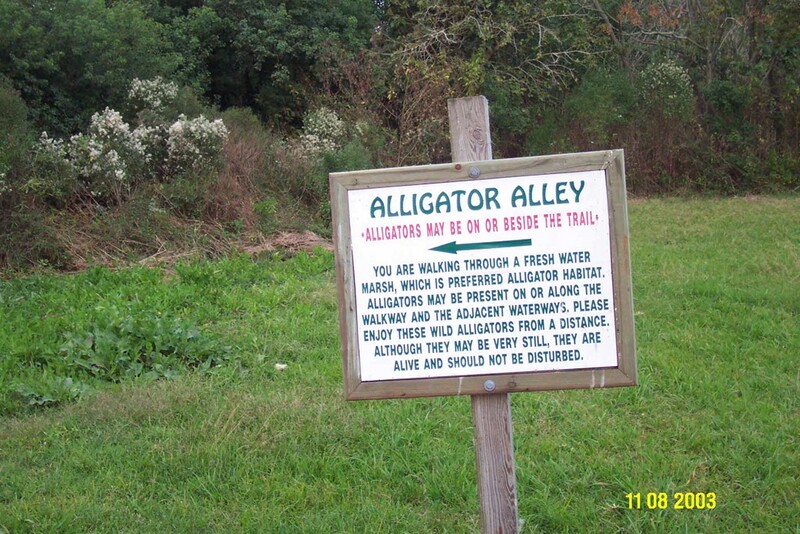 The area was clearly labeled “Alligator Alley” with warning signs in plain sight. We trekked for about a mile through a protected marsh area. A narrow path kept us dry and showed the way. “A sure thing” Jerry said. “Alligator Alley” it was called. Guess how many alligators we saw. You guessed it, “None”. But, it was still nice to get out of the camp and walk a bit through the Louisiana marsh. Before dinner, we were served duck wrapped in bacon with our cocktails. Dinner was stuffed duck and was fantastic. Jerry provided a bottle of wine to add a touch of class. I found a crunchy spot in my duck breast and spit out a piece of steel shot. I guess they had to kill the duck somehow. After dinner, there were more cigars and more scotch. In the evening, we found the Penn State versus Northwestern football game (PSU lost) on television which provided the evening’s entertainment. We were asleep rather early, knowing we would once again be awaken at 4:00 AM. Sure enough, at 0400 (or zero dark hundred as we used to say in the military), the lights came on, the doors slammed and everyone was on their feet. Breakfast was served as usual. New pairings were assigned along with guides. This time, Dr. Meyer and I were paired for the hunt. Two Vietnam veteran trained killers off to show no mercy on the ducks. Our guide was Brent with his dog King. While the ride in the pickup truck was to the same drop-off spot as the previous day, the boat ride to the duck blind seemed to take forever. 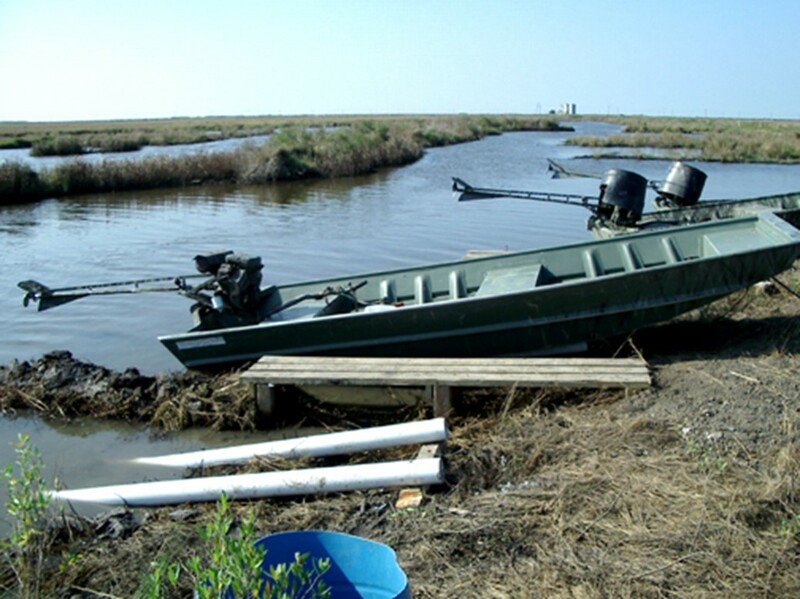 The boats used by the guides were specially designed for shallow water and moving about through the marsh. Their motors were up high and the propellers stuck out the back at a very shallow angle. The good news was that the trip was under a full moon. It was an absolutely gorgeous morning. King was not the least bit shy about taking his seat with the hunters. The boat ride continued through some very narrow passages. King got up front, seemingly looking for alligators. Brent reported that King had survived an alligator attack as a young puppy. 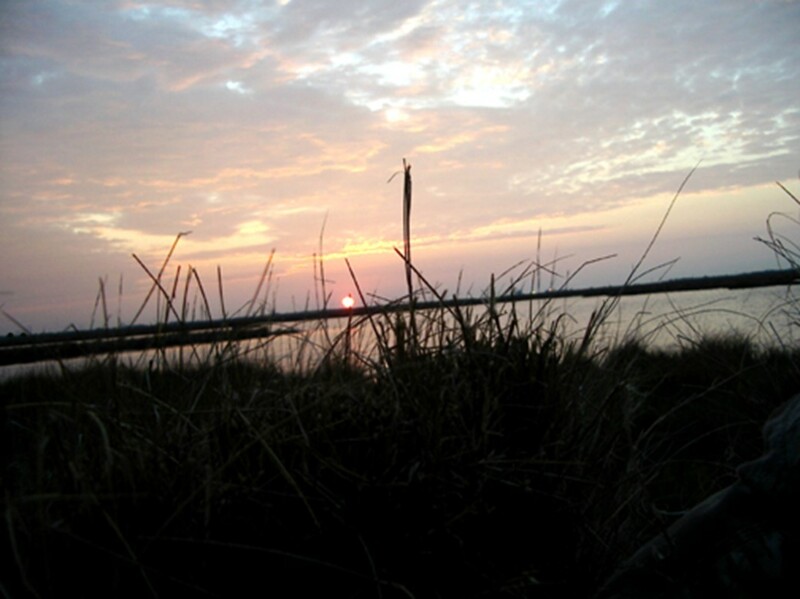 Once in the blind, we were in time to see a beautiful sunrise. Before the sun was visible, its light reflected off the bottom of some clouds with a bright pink glow. Then, the top crescent of the sun revealed itself on the horizon. Ducks only approached us four times during the morning so Dr. Meyer and I had a lot of time to kill. We stayed a full hour more than the previous day and only shot 8 ducks. This morning’s hunt was slow enough that it became a two-cigar morning. And occasionally we even picked up a shotgun. In the end, however, we left most of the ducks for hunters on other days. After the last group of ducks flew in and we all blasted away, only three ducks fell. The guide had shot all three and Dr. Meyer and I missed everything we shot at. While King was swimming around picking up the three ducks, Bart looked at Dr. Meyer and me and said, “Those ducks came in so close that I think Ray Charles could have hit one.” We enjoyed some good laughs on ourselves, knowing we had sent a lot of steel pellets into the marsh, unimpeded by any ducks. After the long boat ride back to the pickup, we returned to camp. There we discovered that the other groups had experienced a similar dearth of ducks. 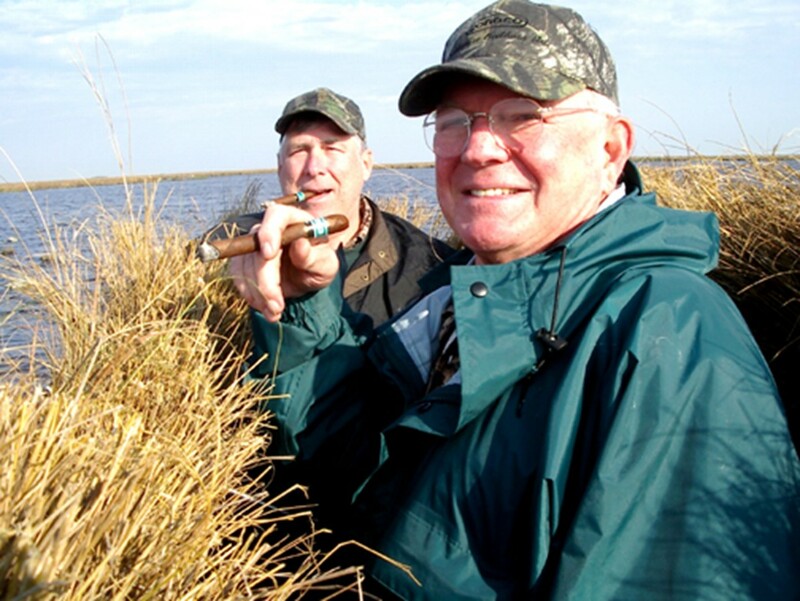 Jerry and Donny had been partners and they shot their limit. Van and John did not. 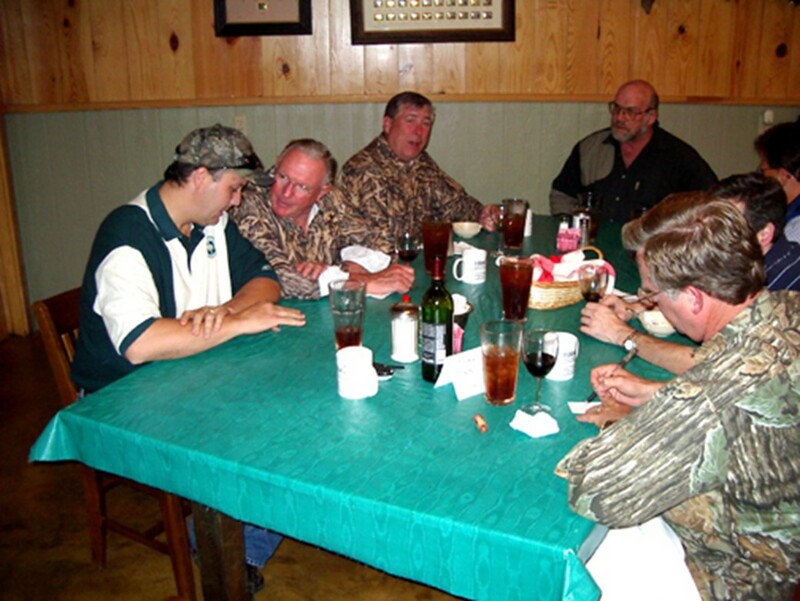 Everyone had a great time, however, and the kitchen had another batch of gumbo waiting for the returning hunters. 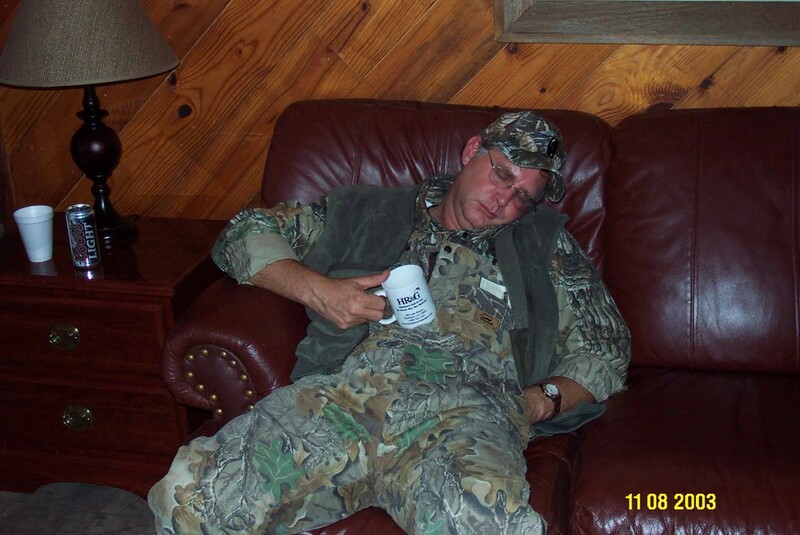 The Club has a tradition of taking pictures of the returning hunters with their game for posting on the HR&G website. 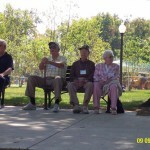 Following are some of the posted pictures. As it was now late Sunday morning, it was time to make plans to return to civilization. John Kober arranged for an earlier flight back to Dallas and Van drove him to the Lake Charles Airport. Dr. Meyer had spent some time getting to know Terry Shaunessey and the two of them were happy to pose for a departing photograph. Jerry Johnson agreed to drive Dr. Meyer and me back to our Cessna at the Southland Airport. 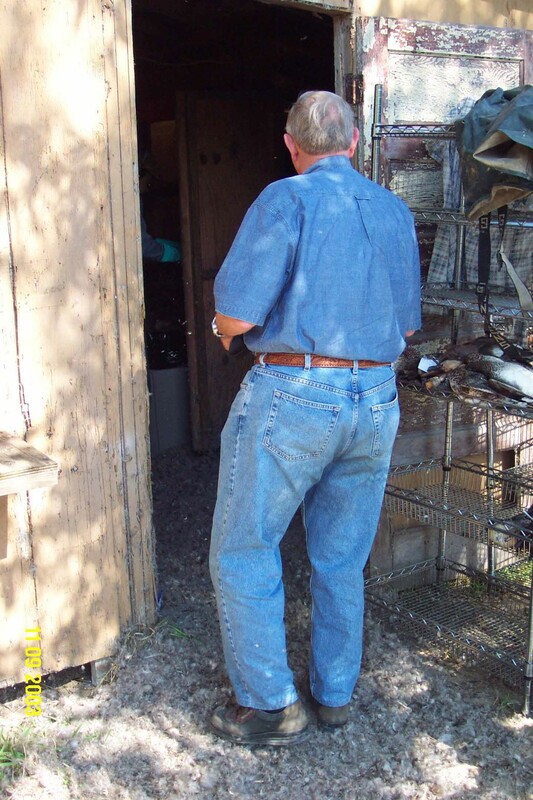 But first, we had to stop at the “Duck Pickers” and collect our ducks that had been de-feathered and gutted. This was a visit to a different planet. The “Duck Picker” shack was staffed by six individuals and obviously, this was seasonal work. The shack itself looked ready to collapse. A quick look into the backyard told a story better than any words could possibly have conveyed. It was almost a history of civilization in southern Louisiana. The shack was divided into three rooms. 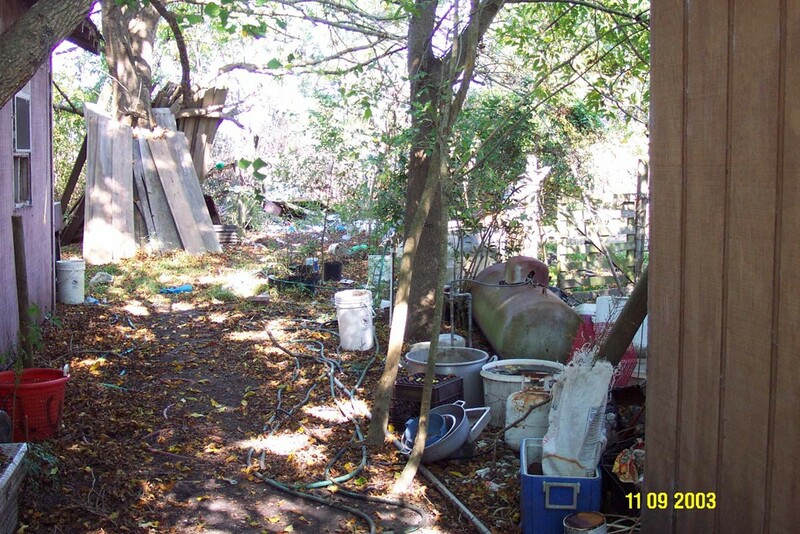 The room on the far right housed a motorized wheel that spun with flappers extending from it. The flappers knocked the feathers and quills off the birds. 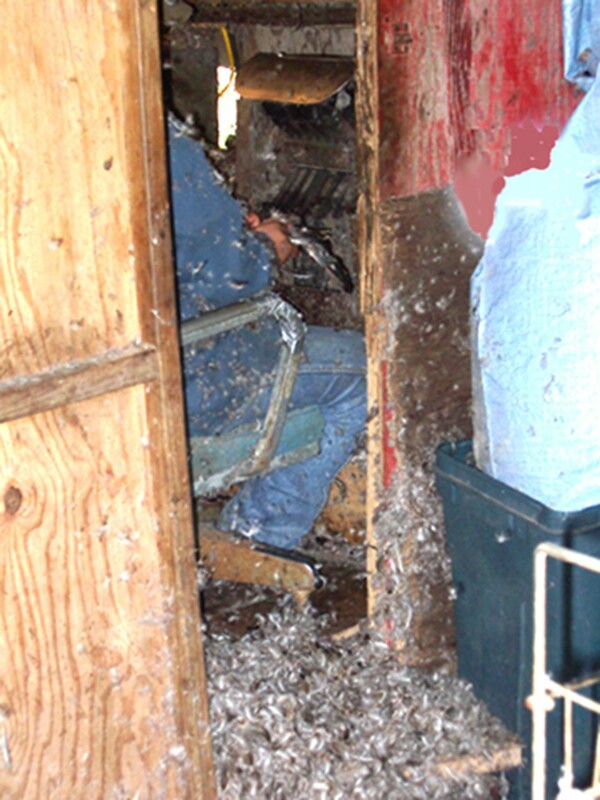 The birds were then handed through a window to a room with a sink. 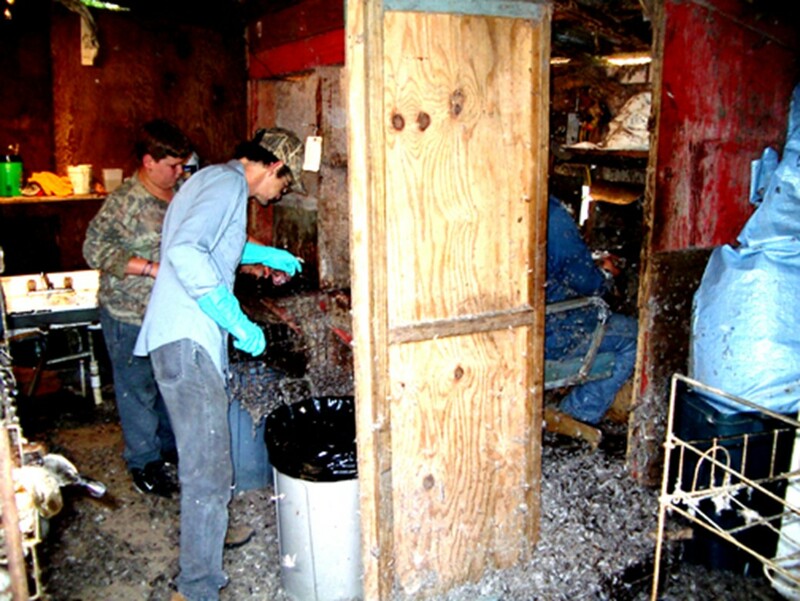 Here the birds were gutted and cleaned. They were then put into plastic bags with the identifying tags attached and placed into a freezer in the third room awaiting pickup. 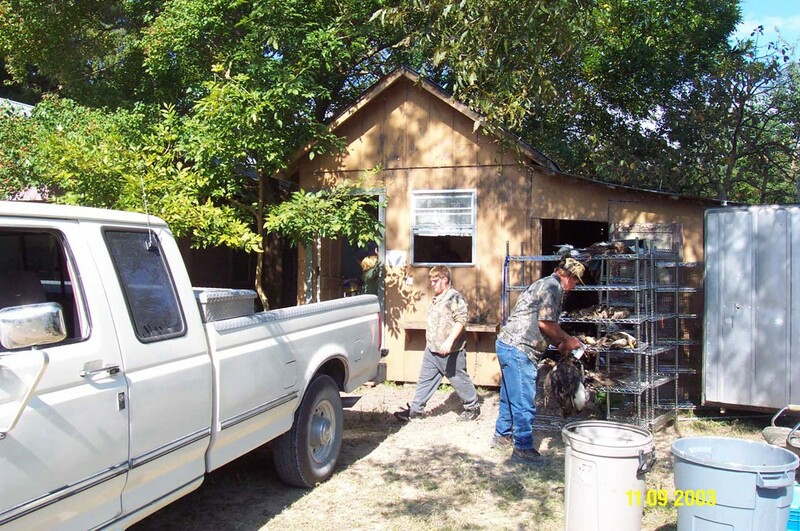 In the third room to the left, hunters paid the “duck pickers” and collected their trophies. We collected our ducks, put them into an insulated carrying bag and headed off to Southland Airport, a short 10 minutes away. The author filed a flight plan while Dr. Meyer arranged to have the airplane towed out of the hanger. The ground crew at Southland was very courteous and responsive. They had already fueled the airplane, so within ½ hour we were ready to depart. We were unable to contact Lake Charles Approach control on the ground, so we took off under Visual Flight Rules (VFR) and contacted them once we were airborne. 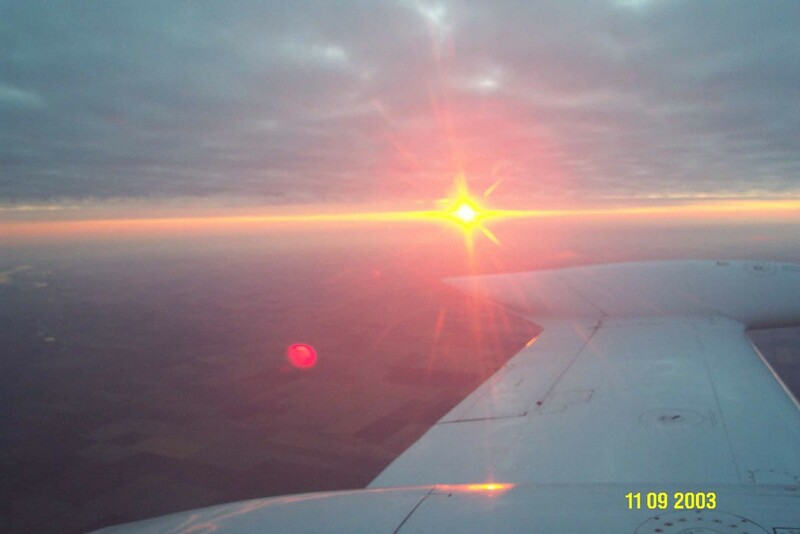 The author took the controls as pilot-in-command for the return journey and shortly after take off Lake Charles Approach had our full IFR clearance ready for us and cleared us direct to the Gary-Chicago Airport. For us, this was the shortest and most efficient routing. We climbed up to 11,000 feet and settled in for a 4-hour flight back home. The return trip was about 40 minutes shorter due to a tail-wind component. During the flight, we had many laughs recounting some of the stories we had heard over the course of the weekend. At one point over Tennessee we encountered icing that began to accumulate on the wings. We requested and received a clearance to descend to 9,000 feet. At that altitude, the ice quickly evaporated and we were back in the clear. We were treated to an almost simultaneous sunset and moonrise as we entered Illinois airspace. Seeing this reminded us that we had been awake in Louisiana to see the full moon and the spectacular sunrise. And now, we were in the air seeing the sunset and watching the moonrise. It had been one amazing day to cap off a fabulous weekend. We are both grateful to the folks at Brookshire Bros. for inviting us along for the hunt.